group_inou is a duo of iconoclasts who deconstruct chiptune, hip hop, IDM, krautrock, jazz and noise to create a unique, clearly distinct and innovative musical style of their own. 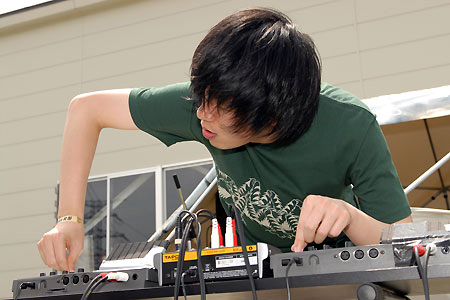 Both members started out playing in garage/punk bands and CP (emcee) had originally intended Imai (DJ/producer) to play drums for his (still active) emo/post-punk band Uri Gagarn. 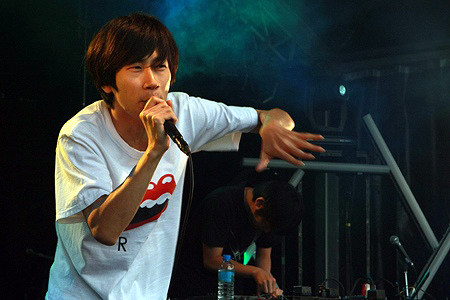 Imai never did play drums for Uri Gagarn but would instead team up with cp to create a revolutionary style of music centered around cp freeflow rhyming and screaming over Imai’s beautifully crafted genre-escaping instrumentals. Their refreshing approach to dance music is progressive, experimental and intelligent and champions an underground/DIY ethic that keeps them level and focussed on pushing the envelope despite increasing mainstream success. Having a background in punk/HC music clearly shows in the wildness and sheer intensity of group_inou’s live performances. cp roams the stage unpredictably like a demon-possessed and often performs amongst the audience on the floor with them or crowd-surfing with mic-in-hand right above them. Imai is just as animated and impassioned behind the mixing board flailing his limbs and contorting his body to match the emotion, soul and ferocity of his music. group_inou have shared the stage with Battles, Gang Gang Dance, deerhoof, OWEN, Why?, Locust, Melt Banana, nisennenmondai, toe, and ZAZEN BOYS and group_inou's spectacular live performances have more than held their own. They are just as comfortable performing at tiny, cramped live houses as they are performing in front of tens of thousands at major festivals such as Fuji Rock and Rising Sun. While group_inou’s groundbreaking music sounds just fine on CD their true brilliance is best appreciated in a live setting.